Diet in the wild: guava leaves, rose plant like leaves of raspberries, blackberries, strawberries, currants, oaks, beeches, hazelnut, game rose, etc. Diet in the zoo: leaves of blackberries and raspberries. This species has many thorn like spines all over its body, including the legs and head. The wings are very leaf-like with veins and brown areas representing dead spots of leaves. KEEPING- The terrarium should at least have the size of 30 x 30 x 40 cm. Temperature of 22- 30° Celsius (74 - 86° F). As the female lays the eggs in the ground, floor covering (sand) is needed. DEVELOPMENT- Egg incubation 7- 10 months, larval 10- 12 months. They hatch in slightly damp conditions. The nymphs go through a series of molts getting bigger each time before becoming adults. 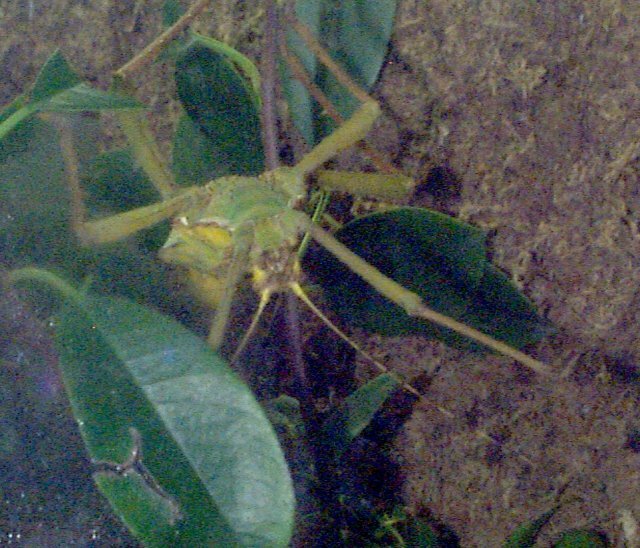 MOLTING- Females’ bright green coloring develops after the 4th or 5th molt, and the males wings appear with the final molt. The sexes of nymphs can be distinguished by the presence of a pointed ovipositor (egg laying tube) in females. The males are able to fly, whereas the females have wings but are unable to fly. Most phasmids have a thorax that can shoot out a milky, smelly, corrosive liquid against predators. This comes in handy because they are too slow moving to have any other way to defend themselves. 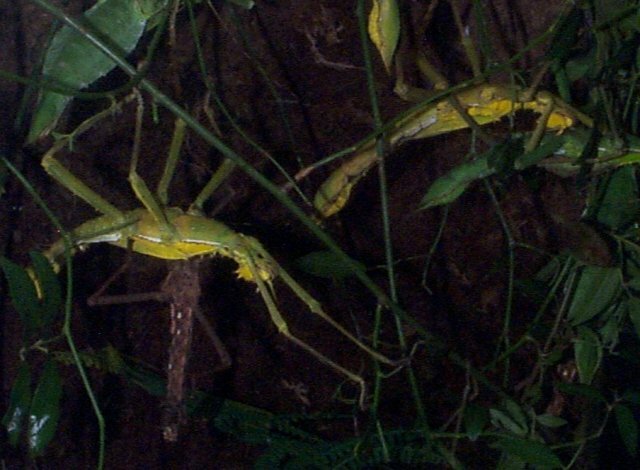 Some Phasmids are used in laboratories for tests on hypnosis, color change, regenerative properties and parthenogenesis. Females lay anywhere from 90 to 200 eggs, then die. Some smaller males may live twice as long as females. The adult male is able to fly. In some species the male is not known or yet to be discovered. In many species, the females lay eggs by parthenogenesis. They blend in extremely well with twigs and leaves. There were eight jungle nymph walking sticks on display at the Fort Worth Zoo. They were all males, although they all looked different. They did very little moving. Only one that I saw moved at all, and even then all he did was move one leg, and then put it back down. They seem to really live up to their name, looking much like sticks, because they were very hard to find in their cage area. These were quite interesting insects. Some were larger than others, some were brown, some were bright green, and some were a very light shade of green. They are probably very hard to hunt because they blend in so well in their surroundings. For instance, when I first walked up to their cage, I didn't see any. It took me a couple of minutes to realize there was one in there, and then there was more and more that I saw. Insects of the world; drawings, photos. and text, by Walter Linsenmaier. Translated from the German by Leigh E. Chadwick.Linsenmaier, Walter.